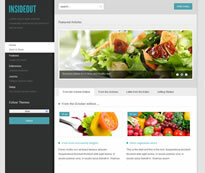 A new theme from Joomla Bamboo and you'll like it. It is clean, very slick and very professional. It has this a very feature; a static left column, so wherever your user is on the page, everything on the left stays on the left - it doesn't move. This is a nice feature and ideal if you have a portfolio or even a very specific set of links that you don't want the visitor to lose sight of. But these are just some of the features. You can get more of them here along with a demo.